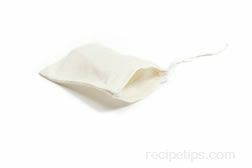 A cheesecloth bag with a closeable opening or a piece of cheesecloth tied with a string to close, which is filled with spices. The spice bag is used for the purpose of adding flavor to products, such as juices, teas, wines, broths, marinades, sauces and pickling solutions. Some are also used to release an aroma in the air by simmering in water.